As fall starts to rear its head, a lot of people in my area are gearing up for hunting season. The autumn brings out the deer and turkey hunters in droves in the Midwest, and that also means that a lot of dogs are getting ready or hunting trips too. Many of us consider our dogs our best friends or pseudo-children, but for a lot of people, dogs are still working animals. The hunting dog is an important part of the dog world. Dogs that do go hunting need to be kept safe, but also, any dog at all that lives in an area where hunting is common should be kept safe. A moving dog running through some brush could be mistaken for game if steps aren’t taken to protect them. That’s why I’ve rounded up a few tips to help anyone keep their dog safe around hunting season. I can’t say that I’ve ever been hunting with a dog. After a few attempts as a child, I found out that hunting just isn’t for me, so I didn’t pursue it anymore. However, tons of my friends and neighbors hunt all sorts of game. They take their dogs out to hunt for possum, ducks, raccoons, deer, turkey, geese, and many other things. And around the world, dogs are often still used to hunt game in competitions. So, if this something you’re interested in, or you just want to keep your dog safe during this season, here’s what you need to know. Hunting season is a time when dogs get loose a lot. Whether they catch the scent of irresistible prey, or they get scared by the sound of gunshots nearby, they are sure to be running more than usual. It’s a lot more likely that your dog will have the chance to run off when you’re hunting simply because they aren’t usually on a leash if they are trained to go after game. So, be sure that your dog’s ID is up to date with your current information. If quiet is important when you are hunting, go with a slide-on dog ID that makes no noise as your dog moves through brush, or a collar with the name and phone number embroidered on the collar would work as well. You will also want to be sure that your dog is microchipped, and that the microchip information is kept up-to-date. Log in before the start of hunting season and update your contact information and any health information about your dog. During hunting season, hunters are always on guard for movement that looks like an animal. If your dog happens to blend in with the surroundings, or looks like a specific type of game, you need to make sure they stand out to hunters. 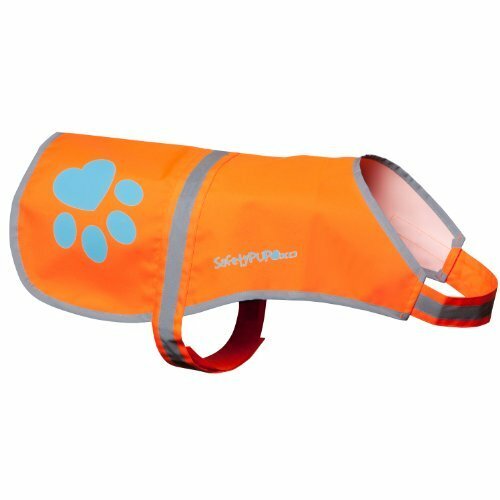 It’s much better to put your dog in a visible orange dog vest than to take the chance that a hunter will mistake them for a tasty catch. Go with either orange or neon yellow, as these two colors are well-known by hunters, who will instinctual register this color as being something they should not shoot at. Whether you go out hunting with your dog, or you just have hunters nearby, chances are you’ll run into more than one type of wildlife. The wildlife around you will be on the move to get away from hunters, so they may not stay hidden like they usually do. You may only have to worry about the stray skunk, or you may be concerned with predatory animals like cougars. Be sure to keep in mind that fleas and ticks are out during this season as well. Find out what to expect in your area so you can keep your dog safe. A lot of guys that I know who hunt do it in part because it gives them a chance to get some quiet time. Away from work, wives, children, or anything else, they get to just relax in the countryside. While that’s a great thing, you do need to let someone know where you are when you have your dog with you. This ensures you and your dog will be looked for if you don’t come back, and that those looking for you know where to start. Even if you don’t think this tip will help you, think about your dog’s safety. You’ll want someone to know where to look to find your dog if anything were to happen to you. This tip is for the hunters. When you go out for a day of hunting, you are often starting the day in layers that you can strip away as the day heats up. Your dog can’t do that. So, if you hunt in a place where the temperature changes are pretty drastic, consider getting your dog a vest and removing it as the day goes on, so that they are also able to combat the changes in weather. Another tip for hunters is to bring a lot of water with you. Your dog will need water when they are out running around being active, no matter if it is hot or cold outside. Letting them drink from steams and ponds isn’t always the best idea – there could be worms or bacteria that make them ill in water that hasn’t been filtered or treated. Another issue that comes from drinking water from natural sources is toxic blue-green algae, which can cause seizures, weakness, jaundice, collapse, vomiting, and even death. Unfortunately, treatment options that actually work for algae ingestion are pretty rare, and there’s never a guarantee that they’ll succeed. So in this case, it’s best to not let your dog drink water from natural sources unless you are 100% sure it’s clean. It’s best to bring some water that your dog can drink. 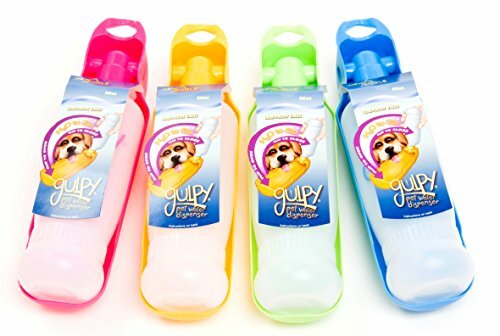 Grab one of these dog-bowl water bottles to make it easier to hydrate them, or pack a collapsible water bowl. Consider stashing some gallon jugs of clean water at a specific spot that you can go back to for refills throughout the day. Sun stroke can happen no matter the temperature or the other weather conditions. Even in the winter, the snow can reflect the sun back up at your dog and get them from that angle. Take breaks whenever you can in shady spots so your dog can get a break from the punishing sun. Your dog can’t exactly reveal if they are feeling the effects of sun stroke, like dizziness or nausea, so the best defense in this case is offense. If you don’t have the ability to hunt in a shaded area, bring a hunting blind or set up a tarp so that your dog has a place to rest out of the sun. This will be just as helpful for you – a long day out in the sun isn’t healthy for you either! 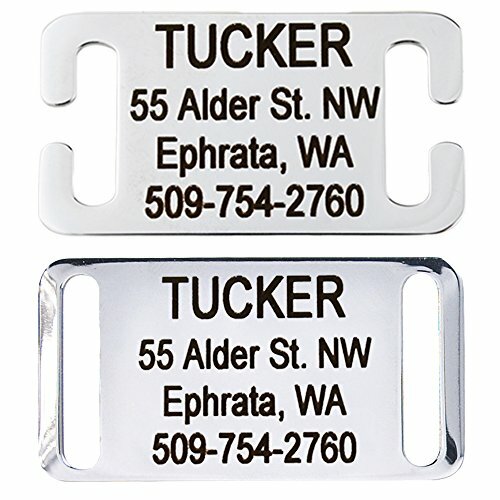 Hunters do have a lot to carry, but you won’t go wrong with a a pocket-sized pet first aid kit. 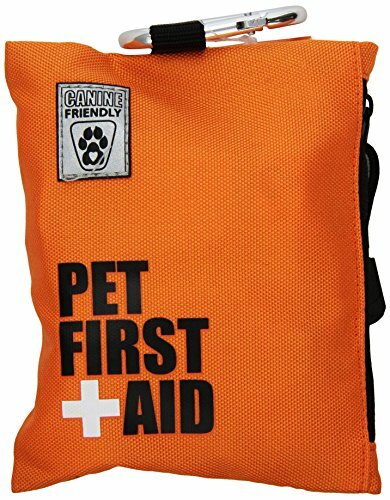 In case your dog gets a cut or worse, you’ll have some supplies on hand like gauze, first aid tape, a styptic pencil to help stop bleeding, and antiseptic to clean wounds.Essentially, this kit will help you stop and control bleeding, prevent dirt from infecting a wound, and patch up small injuries that don’t really need a vet. It’s a great thing to have if you are going to be pretty far away from a road where you can quickly get to a vet, and your dog will thank you for thinking of their safety. Breeds that are commonly used for hunting are often prone to a few specific types of injury or illness. One common breed used for hunting is the Labrador Retriever. This dog can be prone to a condition called “hunting dog hypoglycemia”. Their blood sugar can drop drastically without any warning, so you’ll need to have some water and snacks on hand throughout your trip to keep them safe. Hunting dogs can also often have joint problems, which can be very painful and even cause them to lose the ability to move. If you have a hunting dog, keep an eye on them for these common problems. Any time there is a chance that your dog could be shot, mauled, or otherwise injured, you should have a vet on speed dial. Hunting season can lead to a lot of injuries and illnesses, so be sure you know the fastest route to emergency services from where you are, or from your home. With unpredictable wild animals behaving oddly, gunshots, and the chance of your dog getting spooked and running, this is important. You’ll want to be able to call the vet so they know you’re on the way if you need quick help. Here’s the most important tip on this list in my opinion. During hunting season, there are a lot of things that dogs are exposed to that they should not be ingesting. For example, toxic plants in the woods, or dead animals, can be dangerous for a dog to eat. And if you are focused on hunting, there’s no way to keep your eye on your dog every second of the day. The biggest concern for dogs in the woods is mushrooms. Identifying which mushrooms are edible can be very difficult, so it’s best to not let your dog eat any mushrooms you find. Toxic mushrooms can cause kidney damage, lots of pain, seizures, vomiting, diarrhea, and liver damage in dogs. Dead animals can be another problem. They can carry things like rabies and worms, which can definitely make your dog very sick. Keep your dog away from any dead animals, even the one you just shot. You never know if the animal has worms until you’ve inspected it thoroughly. If you use clay pigeons for shooting practice, or you hunt in an an area where pieces of clay pigeons could be, beware. Dogs can get serious liver and kidney damage if they ingest pieces of a clay pigeon, due to the lead and tar content in the pigeon. Be careful that they don’t ingest any part of a clay pigeon. Hunting season does bring about a lot of things to watch out for. A hunting dog that isn’t well trained may not know to stay out of range from buckshot scatter, for example. It’s always a good idea to make sure that an inexperienced hunting dog is on a leash so that you can control where they go. It’s also a good idea to train a new hunting dog with an experienced hound that can show them the ropes. Look for other hunters in the area who hunt with dogs who may be able to help if this your first hunting dog. Hunting with dogs can be a blast, no pun intended, but safety is very important. Dogs have been helping humans hunt since the beginning of their role as man’s best friend, so you’ll be tapping into an ancient relationship when you do this. The safety tips in this article will help you keep your dog healthy while you do this. Additionally, many of these tips can help you if you are like me – someone who lives in a hunting-heavy area, and doesn’t hunt, but does have dogs that could be injured during this busy season. Once your dog is well trained to hunt with you, you’ll likely find that the two of you work like a well-oiled machine, and you don’t have to keep such a close eye on them. But until that point, be sure that your dog is always under your supervision to prevent any bad accidents.